A shiny 2017 NBA Western Conference Finals trophy sat alone in a room surrounded by a black curtain within walking distance of the AT&T Center floor. After the final seconds counted down to the Golden State Warriors’ third consecutive trip to the NBA Finals, sidelined Warriors head coach Steve Kerr came from the locker room in time to shake every coach’s and player’s hand before they entered the private room for the West trophy ceremony. The Warriors put on their fresh 2017 NBA Finals hats and T-shirts during a laid-back celebration, with a grander celebration in mind weeks from now. “Don’t get me wrong, we appreciate this opportunity,” Stephen Curry said after the Warriors’ 129-115 series-ending victory in Game 4 over the injury-plagued San Antonio Spurs on Monday night. “Playing in this league, you can’t take anything for granted. Thirty teams suit up every year trying to get to this point, and only two teams do. Blame LeBron James and the Cleveland Cavaliers for forcing Curry and the Warriors to have this Finals-focused mentality. The Warriors were 2015 NBA champions and owned a commanding 3-1 lead in the best-of-seven 2016 NBA Finals over the Cavaliers. Then, Murphy’s law overtook the Warriors as they lost Draymond Green to suspension in Game 5 while also losing then-starting center Andrew Bogut for the series to injury. Cleveland won the next three games, including a hotly contested Game 7, and made history as the first team to overcome a 3-1 deficit in the Finals. Embarrassment and trolling have followed ever since for the Warriors after James and Kyrie Irving led the way to Cleveland’s first NBA crown. James, Irving and the Cavaliers are still in a battle with the Isaiah Thomas-less Boston Celtics in the Eastern Conference finals. Cleveland holds a 2-1 lead, and the earliest this heavy favorite could win the East is with two straight victories, concluding with Game 5 in Boston on Thursday. The Warriors won’t begin practice until Thursday and will have lots of time off before the Finals begin in Oakland, California, on June 1. While the Golden State players and coaches won’t say it, their co-owner Joe Lacob did say he wants James and the Cavaliers in the upcoming Finals. “I don’t care who we play, but my preference is Cleveland. We have some unfinished business,” Lacob said. To aid the Warriors’ fight to become the king of the NBA over the Cavs or the fighting Celtics, they have enlisted the aid of 2014 NBA MVP Kevin Durant. 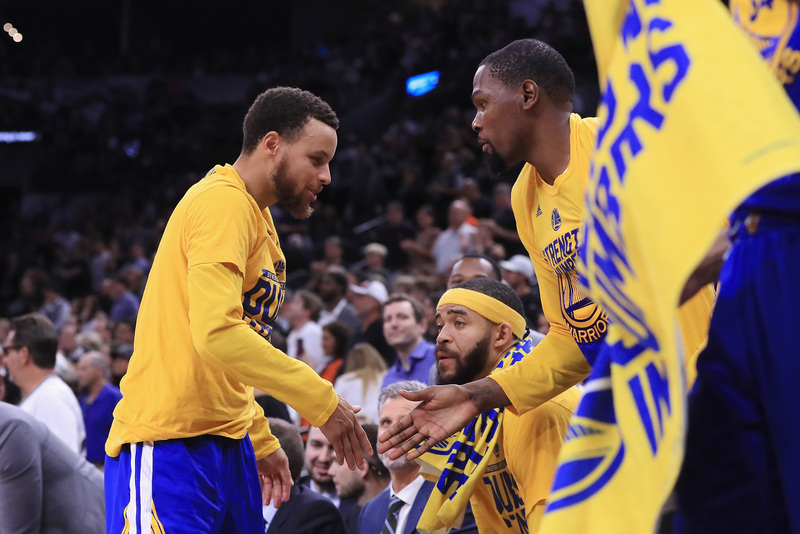 Stephen Curry, left, high-fives Golden State Warriors teammate Kevin Durant during the second half Monday night against the San Antonio Spurs in Game 4 of the Western Conference finals at AT&T Center in San Antonio, Texas. Durant and the Warriors have gone 12-0 on their way to the Finals, the first team in NBA history to do so. While the 10-year NBA veteran said he would be happy “win or lose” as a member of the Warriors, winning a title over James or the Celtics is the only thing missing from his future Hall of Fame career. Durant vs. James II in the Finals would add a forward superstar battle that could bring flashbacks of Magic Johnson versus Larry Bird from the 1980s. Durant lost to James and the Miami Heat in the 2012 Finals as a member of the Thunder. While Durant is proud of being undefeated in these playoffs, he would be prouder to be a first-time champion. Don’t be surprised if the Warriors’ Finals battle is without Kerr on the sidelines. Kerr told The Undefeated that he did not know whether he would be able to coach during the NBA Finals after complications from back surgery sidelined him for the past 10 playoff games. ESPN.com’s Ramona Shelburne said although Kerr traveled with the Warriors to San Antonio, it should not be read as progress because he is still in pain. Warriors acting coach Mike Brown has led the team to victory during the past 10 games. Brown is a former Cavs coach who coached James during the 2007 Finals and also coached Kobe Bryant and the Los Angeles Lakers. Whether it’s Kerr or Brown on the sidelines, Durant believes the veteran Warriors will be fine. “Coach Brown is just an extension of Coach Kerr, and the rest of the coaching staff is the same way,” Durant said. “Us players, we know what to do. We’re a veteran group. We’ve been talking about it all season, and we know what Coach expects of us. The Warriors have two rookies who have made the Finals in their first season in guard Patrick McCaw, who has started three playoff games, and seldom-used center Damian Jones. The Warriors also have a 15-year NBA veteran who has made the Finals for the first time in veteran forward Matt Barnes, surpassing veteran forward-center teammate David West by one season. Barnes was excited to finally get to wear an NBA Finals hat, but he had another hat in mind.